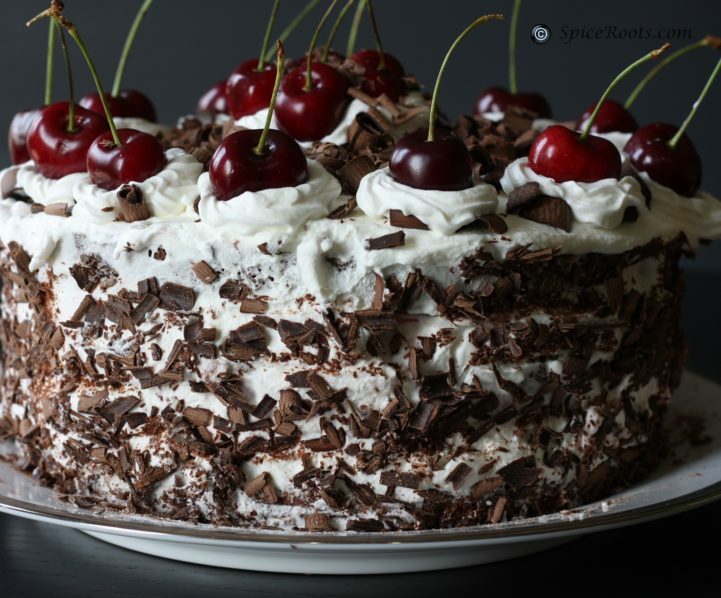 Celebrate the international cake day with the delicious black forest cake. International cake day was founded in Russia by an international non-commercial project that focuses on global cultural, humanitarian and peacemaking programmes. It was first celebrated on July 20, 2011, in nine countries. It was kicked off with the motto I cake you. This chocolate cream covered delight may seem like a lot of work but it is worth it. Here are the ingredients needed for this creation. Brush grease on 3 cake pans. Boil the kettle. In a small pan, gently heat the butter and chocolate chunks. Stir until they melt. In a mixing bowl, add the flour, sugar, cocoa and bicarbonate of soda with a pinch of salt and mix. Whisk the eggs and milk together. Scrape the melted chocolate mixture and egg mixture into the dry ingredients, add 100ml boiling water and whizz briefly with an electric whisk until the cake batter is lump free. Pour the mixture into the three cake pans and bake for 25 minutes. Ensure that the cakes are all well baked. To test they’re well baked, Stick a skewer in the middle and check there is no paste stuck to the skewer. Prick the cakes a few times with a skewer. Drain juice from some of the cherries and gently pour on the cakes. Then cool the cakes. Mix together the remaining drained cherries and jam. In a small pan, pour 10 tablespoons of cream and heat until it starts to simmer. Chop the remaining chocolate and put in a heatproof bowl, pour over the hot cream and stir until melted. Set aside until spreadable. Whisk cream and icing sugar until its a smooth paste. Spread over 2 cakes and stack the cakes on top of each other. Stack the cakes together. Spread the chocolate cream over the third cake and sit on top of the other cakes. Place the remaining cherries on the top layer and serve.